Known for its dark story and clue-gatherting gameplay, the Danganronpa series has now expanded into three games (one of which we previously reviewed here) and an anime series. The games were a lovely blend of mystery, ultra-violence, and story driven characters. The art style was surprisingly unique, forming the dark atmosphere of the world which made the franchise stand out and informed the pretty awesome story. The ending of the previous two games was jolting to many players including myself, and that alone makes those games memorable. Now the third game has come to America, and explaining the story will somewhat spoil the ending of the first game. With that being said, there are some minor spoilers ahead for our Danganronpa Another Episode: Ultra Despair Girls review. The world has fallen into anarchy, you learn the people behind it are psychotic children with a hatred towards adults and people who do not fit into their idea of a new fun filled world. Their world should be fit for the best, hence why Hope Academy was created: to single out the best of the best. You play as Komaru Naegi. That name certainly sounds familiar doesn’t it? Ever since her brother left for Hope’s Peak Academy, she has been held up in an apartment room by herself. An unknown person has been feeding her daily. On a random day, she is attacked by Monokuma. However, this is not the same one from the first game. It’s a robot programmed to kill. She’s later rescued by Byakuya, the arrogant know-it-all from the first game. 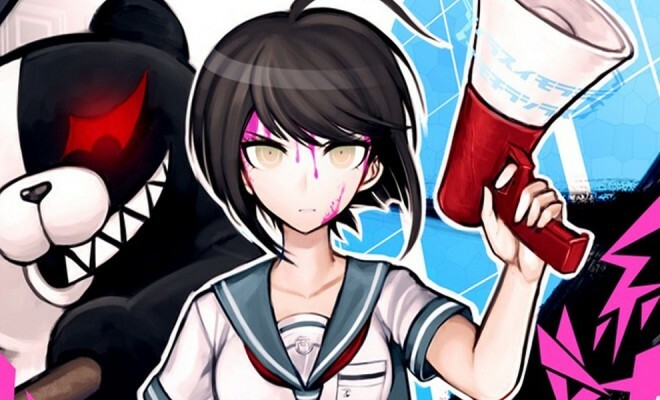 Komaru is left with a mysterious device to fight off hordes of Monokuma bots controlled by a group of kids. She becomes locked into their twisted game for their own amusement. I like the story of this game. 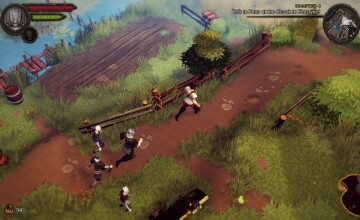 It really adds to the lore of the previous two games by allowing players to see what is happening outside the school or island. However, much of the story is lost if you haven’t played the previous games so I highly suggest you do so. There are a lot of easter eggs and references that could confuse a newer player. This new game’s style is drastically different than the first two games. 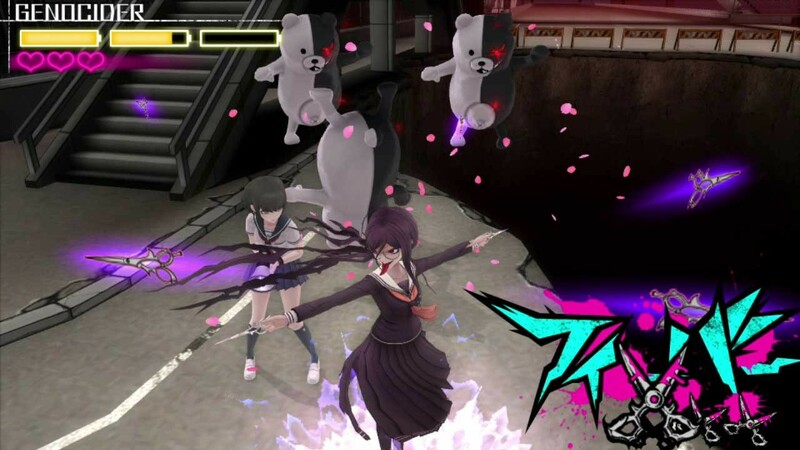 Danganronpa has turned from a mystery adventure game into a third person shooter. Gameflow is pretty simple. You play through levels designed by one of the antagonists of the Monokuma Kids. You defeat a kid and move on. Overall, the gameplay is pretty interesting and NISA tried to keep it as varied as possible. 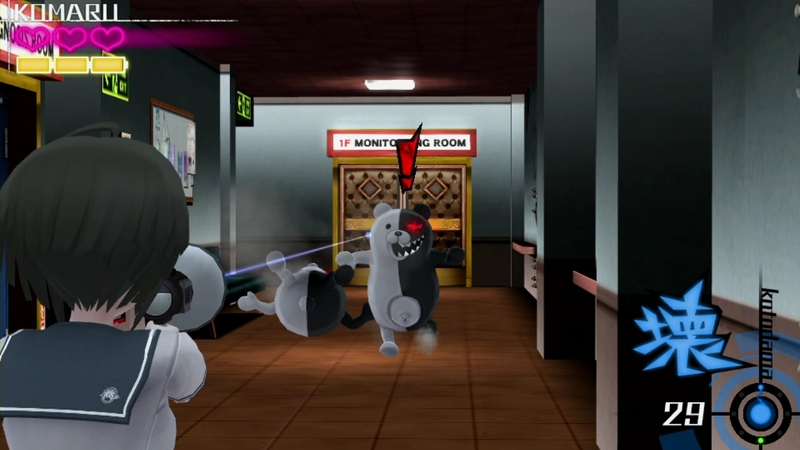 You use a megaphone gun that disrupts the circuitry of the Monokuma robots. There are a wide variety of bullets to use against the bots and each have different functions. What I really like about this game is how scarce ammo is. Late game, you really have to pay attention to ammo conservation. It adds a nice level of challenge to the game without sacrificing the player’s dignity or patience. In addition to shooting bear robots, you will have to partake in the occasional stealth minigame. Each one must be done without being detected and you must formulate a path by timing movements to get to the end. After all, when a room is filled with robots designed to kill, you probably can’t take them all on. When in combat, you have two characters to tear through the hordes or robots: Komaru and Genocide Jack. You may remember the latter character as the serial killer from the first game who is the alternate personality of a certain famous author. You can switch between the two characters at whim. Jack plays like a hyper aggressive melee attacker while Komaru uses the megaphone gun mentioned earlier. 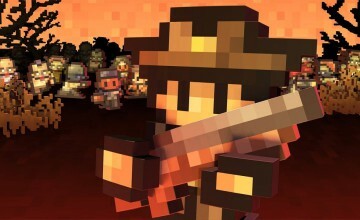 Think of Jack like a Limit Break mode to dispatch groups of enemies at once using a plethora flashy combos while on a timer. All in all, while the game does get repetitive after a while and the excessive, almost useless dialogue plagues this game, I still came out liking it. 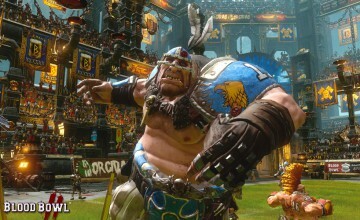 The bland level design makes some of the gameplay flaws more obvious and can get in the way of enjoyment for some, I still can’t deny it’s fun to play. That being said, you’ll pretty much know how you feel early on. The game throws everything it has to offer gameplay-wise within the first hour or two. If you love Danganronpa, this is a must buy. If you didn’t enjoy the series, or if you’ve never played Danganronpa in the past, I would definitely give this a pass. You can pick it up for the Vita digitally or retail.